All first-year students are required to take foundational courses that are essential for their training as lawyers. During the fall semester, students take Civil Procedure, Property, and Torts. During the spring semester, students take Contracts, Criminal Law, Constitutional Law, and Legislatve Regulation. First-year students take Lawyering Skills I and II, respectively, in the fall and spring semesters. Each of these two-credit courses introduces students to critical lawyering skills, including legal analysis, predictive and persuasive writing, research, counseling, negotiation, and oral advocacy. Those looking to receive a first-rate law education while enjoying “Southern hospital­ity at its finest” would be wise to look into University of Richmond School of Law, where students say “The open dialogue among students and between students and professors is truly special.” By all accounts, a “very friendly,” “almost family-like” atmosphere prevails at this small school. “It amazes me that I’m able to walk down the hallway and have even professors whose classes I have not taken greet me by name,” a satisfied 3L writes. The “well-educated, well-published” faculty members here are “dedicated to bettering their students and compassionate to their needs as individuals.” The majority of professors “offer their home numbers and cell phone numbers so that we can call whenever we need help, or even just a little advice.”Professorial love is of the tough variety in the classroom, where students say “the use of the Socratic Method” “can be a bit intimidating,” particularly for first-year students, though “It makes class entertaining and ensures that you are prepared,” a 1L offers. All students here go through “an outstanding lawyering skills program. During these courses, our legal writing and actual courtroom skills are emphasized in very precise, methodical ways,” a 2L writes. If students run into academic difficulties, they can take advantage of Richmond’s Academic Success Program, which provides a full-time faculty member to assist students with their course work. The downside to the school’s small size is “limited course selection,” and “only one section” of most upper-level classes each semester. To expand its offerings, the School of Law partners with other schools within the University of Richmond—for example, the Robins School of Business and the Jepson School of Leadership Studies—to offer students a “diversity of dual degrees” which allows students “to really focus on particular fields of interest.”Richmond enjoys “a tremendous reputation in the Commonwealth of Virginia” and students believe that “the fact that there are so many opportunities for legal experience in Richmond,” the state capital, “is a great strength” of the school. “We have access to county, state, and district courts and often have lectures and course[s] taught by Virginia Supreme Court Justices,” a sanguine student writes. Many clerkships and externships are made possible through a “highly involved alumni community” in the area and help students to figure out what type of practice they would like to enter when they graduate. Because many students “fall in love with the city,” the school’s Career Development Office (CDO) has historically taken a somewhat regional approach. However, it “recent­ly hired a new dean and two new staff members,” and students are beginning to feel that the CDO “has the resources to help any student find a job anywhere in the world.” The law school also provides guaranteed summer stipends to first- and second-year law students who obtain unpaid government or public-interest internships.Administrators are described as “doting,” and all maintain an “open-door policy.” While there are a few reports of disorganization, the vast majority here believe the “personal approach” and lack of red tape transcend the minor difficulties. The “entire campus has wireless Internet access,” which allows students to “study anywhere.” In addition, “You are provided your own personal study carrel in the library, which func­tions as a locker and, most importantly, a nice quiet place to study.” If students require more incentive to head to the library, “ample” staffing ensures that all customers “find what they are looking for.” The student body’s biggest complaint is that Richmond is “very underappreciated.” “I have friends at Georgetown, UNC, Wake Forest, Duke, NYU, and UVA law schools, and none of them are as happy as I am at Richmond,” a 2L boasts. 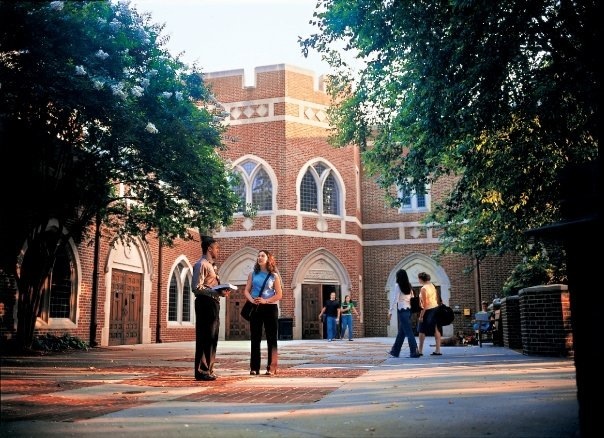 Want more info about University of Richmond School of Law? Get free advice from education experts and Noodle community members.